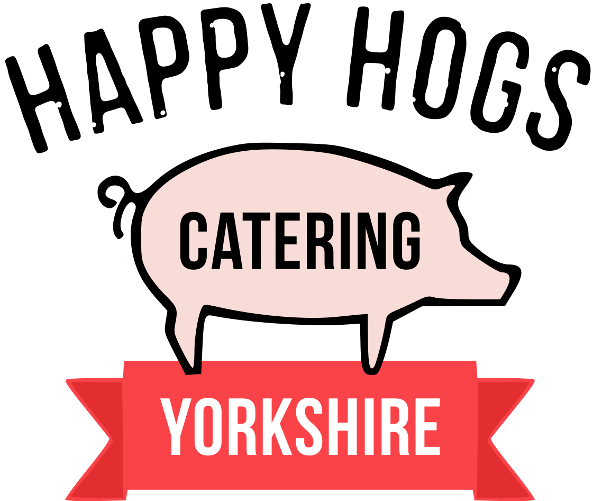 Yorkshire Hog Roast Catering from free range hog roast award winning caterers. With bespoke wedding catering menus to suit your big day. Succulent & Tender Meats Marinaded In Our Own Home-Made Rubs & Sauces. We only service our Hog Roasts & BBQ with the local ingredients, fresh salads & home-made sides. Better than a burnt banger! 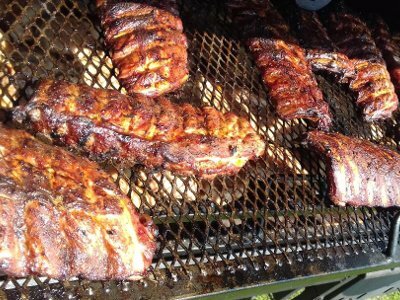 We Can Provide Classic Traditional BBQ Catering, Cypriot BBQ Catering & American Smoke Pit BBQ Catering. Everything from our Chocolate Cakes, Donuts or Tarts through to Cheesecakes & Cheeseboards are the very best available in Yorkshire. Whole Hog Roasts slow roasted for tender pulled pork. Free range pigs bred near York and only 100% outdoor reared. 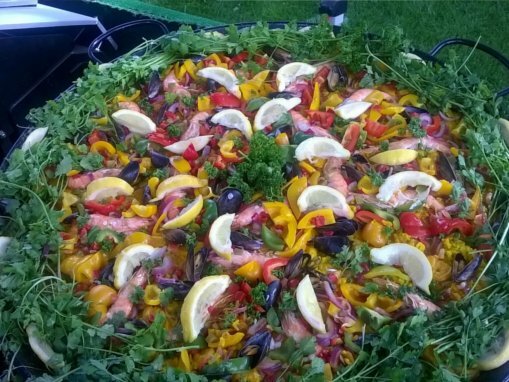 Big Pan Catering or Paella Pan Catering for any event. Our team of professional Yorkshire wedding caterers. Free Range Yorkshire Spit Roast Lamb Caterers. Locally reared whole steer cuts for our Beef Spit Roasts. Happy Hogs Catering have been awarded 'Leading Hog Roast Catering Services 2019' and 'Most Environmentally Friendly Wedding Caterers 2019'. We're barbecue caterers based near York, and serve the Yorkshire region with our free range hog roasts and free range barbecue outside catering services. 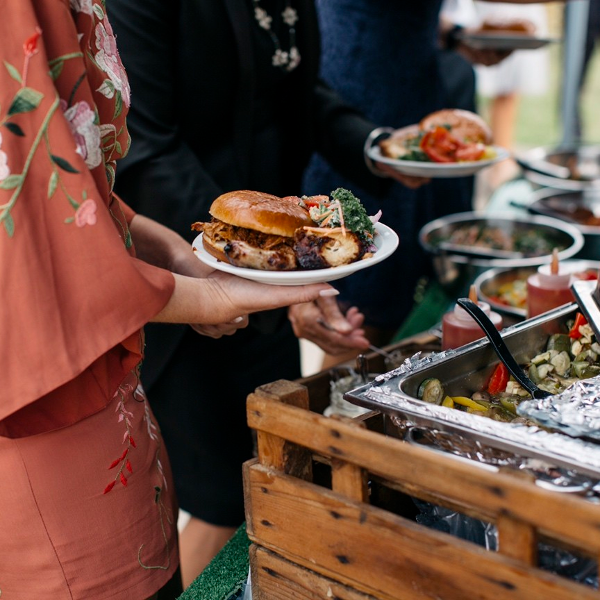 We are sure to both make your mouth water, and wow guests with our amazing free range hog roast and BBQ catering services known locally as 'The' Caterers of choice for wedding and party event catering. Our friendly, polite, and dedicated uniformed team of outside caterers, will work diligently to provide a top class hog roast or barbecue service for your event, wedding reception, or special occasion. We help to make informal dining a relaxed, enjoyable experience. Providing tasty free range special breed hog roast hire catering from near York, encompassing menus to suit all occasions and events. With our flaming hand-made home-made burgers and our own rubs and sauces for our ribs and amazing free range sausage really makes any event or occasion special with our catering delights. Our informal BBQ and slow roasted pig roast wedding dining packages are great value helping to make wedding dreams come true and have won us 'The Norths Wedding Caterers of the Year 2016, 2015 and 2014 and made us Finalists in 'The England and Wales Food Awards 2014 too. We have recently been nominated in the Countryside Alliance Awards, we have won Gold in the Bridebook and the Lux Wedding Awards and been a runner up in the Guides for Brides Wedding Awards. Happy Hogs Caterers in York are pleased to have now won many various wedding industry awards in the catering categorys, going up against many Yorkshire and national catering specialists and we thank all of our clients that have voted for us in these prestigious awards. Our hog roast hire and barbecue services in York are exceptional, from the professional polite uniformed staff that have both experience and food hygiene certificates, to the award winning elite quality free range meat that we use in all our barbecue menus all prepared in clean professional premises, regularly inspected by the EHO and maintain a 5 out of 5 star rating with full public liability insurance. 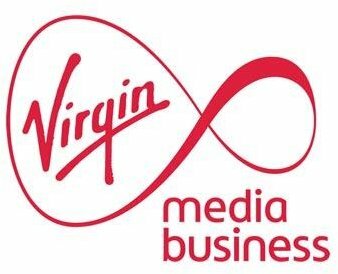 We have a broad portfolio of clients we regularly provide outside catering for, from; Coca-Cola to Warburtons and many many individuals for which we have done wedding catering and party catering for allowing them to relax and enjoy themselves knowing that they are in the safest of hands that won’t let them down. 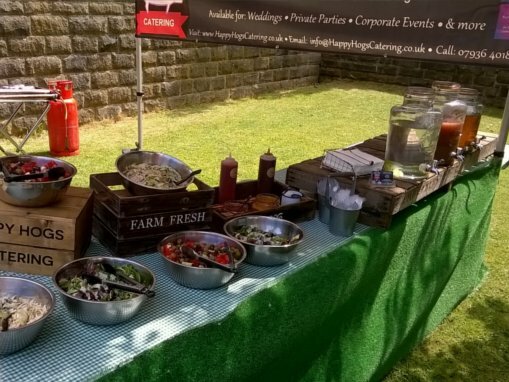 Our talented team of dedicated York hog roast and barbeque caterers work diligently all year round developing new and exciting menus that can be carried out in just about any surroundings and for any occasion for many hog roast hire occasions in Sheffield, Leeds, Hull and York areas. Our crisp free range hog roasts are the closest thing to culinary heaven we can think of as we bring out the amazing flavours of our elite award winning free range pigs and prepare some of the finest meat for our special bbq menus which is why our customers keep coming back to us over and over again for some of the finest bbq catering food ever tasted in Yorkshire. For a great tasting free range hog roast. Hi I just wanted to send a note today to say thank you for the food and service. 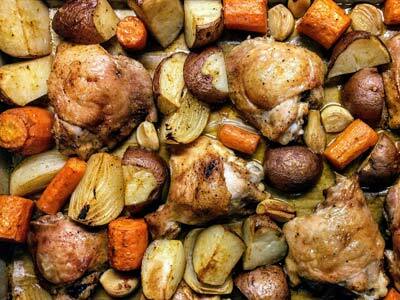 The staff were great and it all went smoothly with no issues and the food was delicious. I would like to say a HUGE thank you for your support at our two recent BBQ Fun Days. 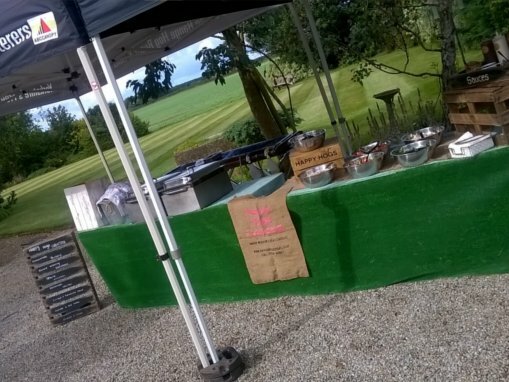 We were certainly very lucky with the weather again (despite a small rain shower at the first event) and everyone had a wonderful time – I’ve had some lovely feedback from our guests about your BBQ food.It was a pleasure working with you again and no doubt I shall be in touch again next year! I just wanted to say a big thank you to you from everyone here at Bluetree. 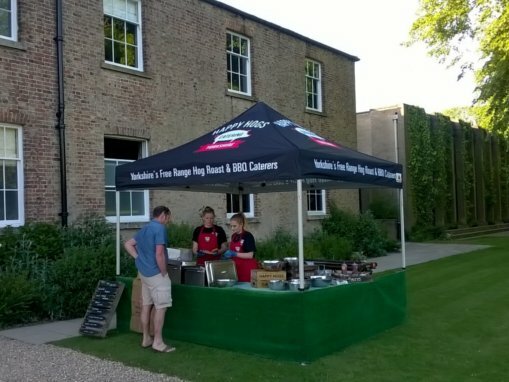 We really enjoyed all the food that you provided for us last Friday – the BBQ was great quality, well cooked and very well organised -no long queues as we’ve experienced with other caterers! Thank you so much! Weekends : We are always busy covering events but please feel free to call you can always leave a message and we'll get back to you. Find out more about Happy Hogs Catering professional caterers. Happy Hogs Catering © 2019. All Rights Reserved. Website empowered by Simulant.